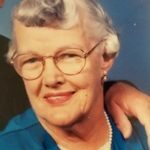 Added by Bill Bowman on March 18, 2018. 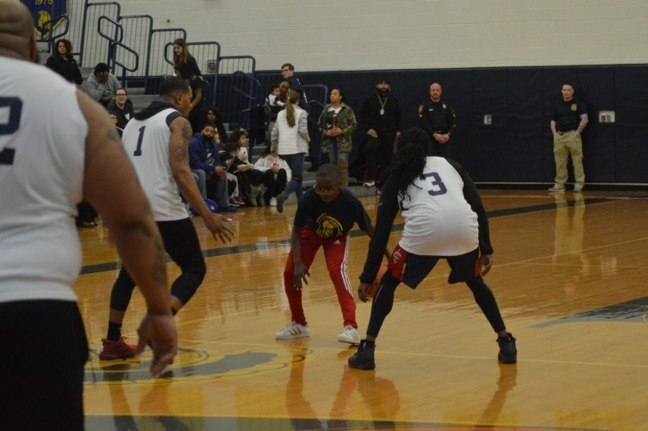 Some kids got the chance to play against the pros, too. 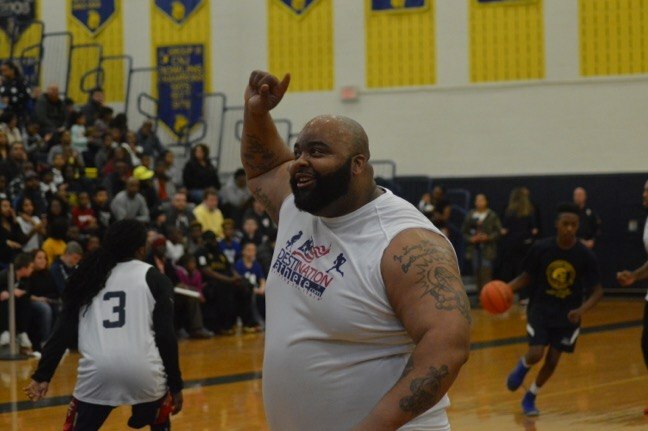 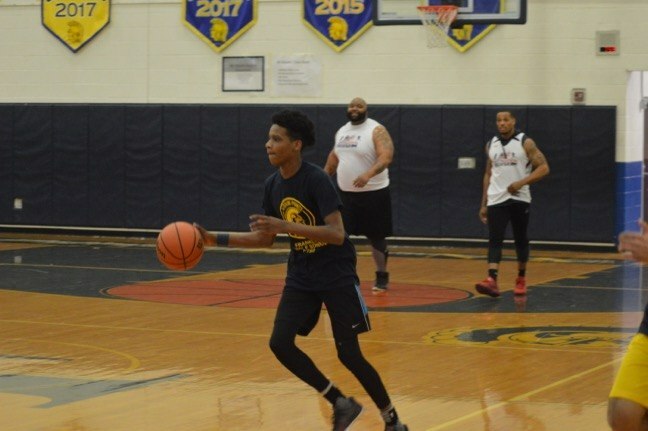 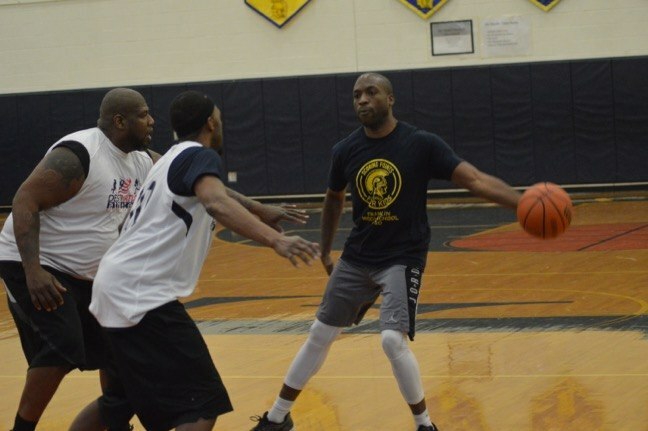 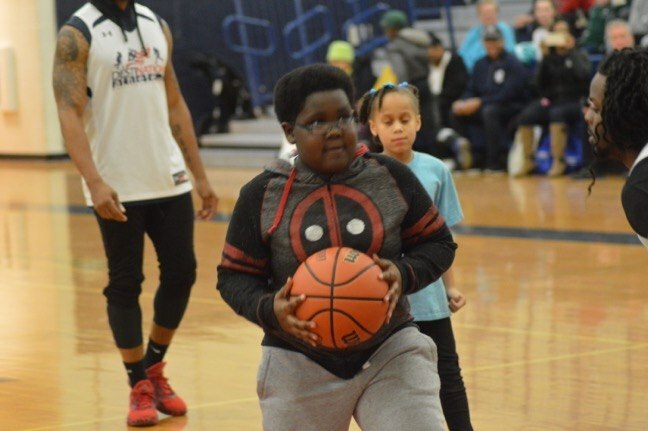 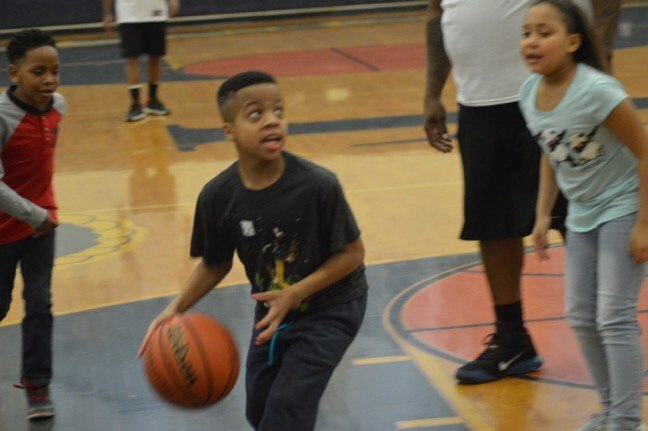 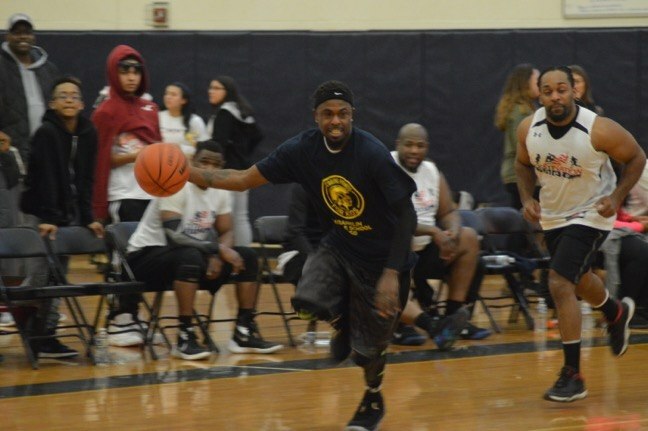 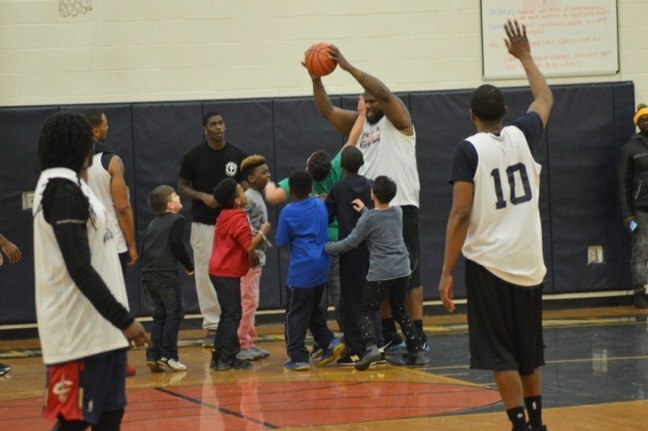 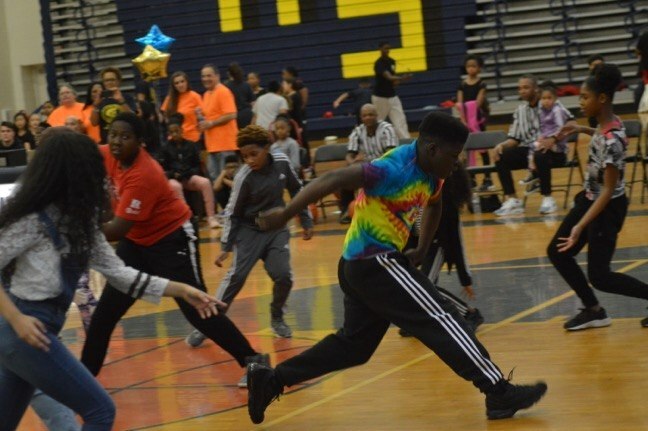 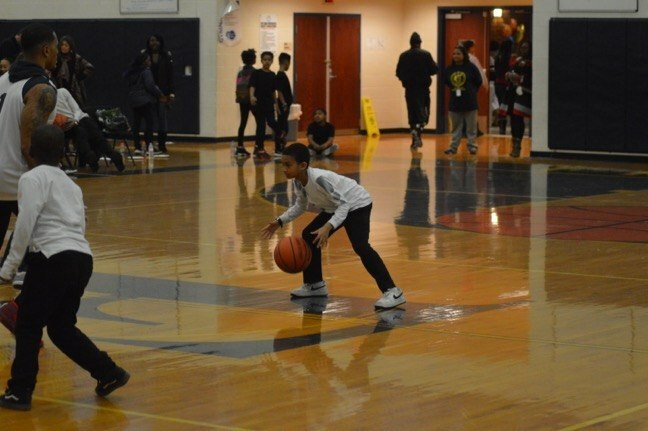 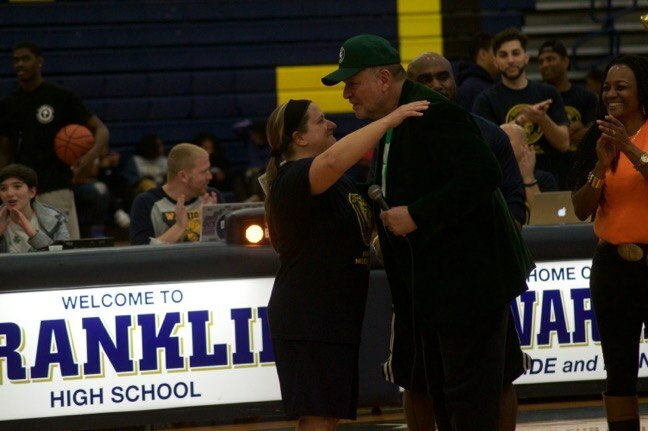 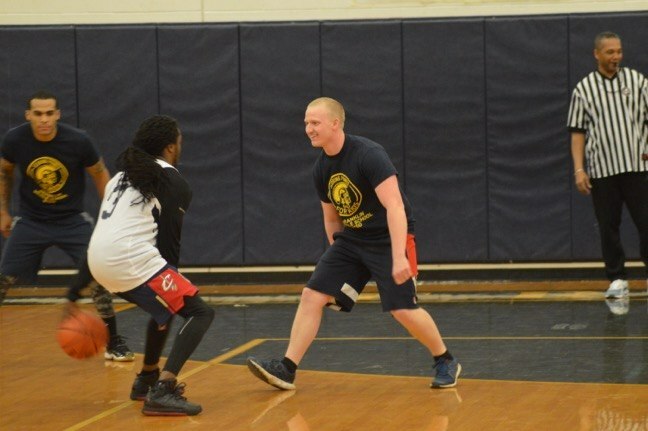 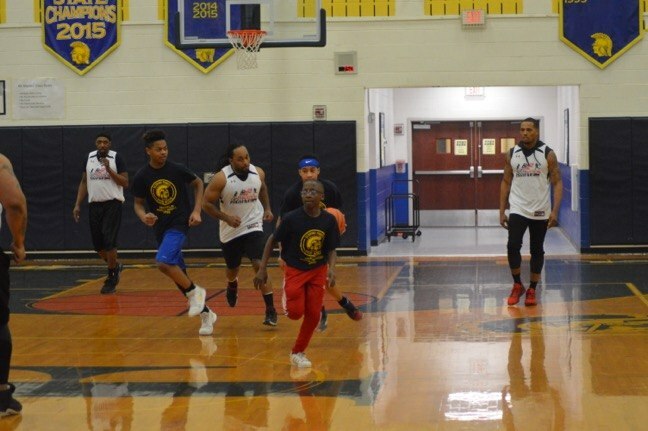 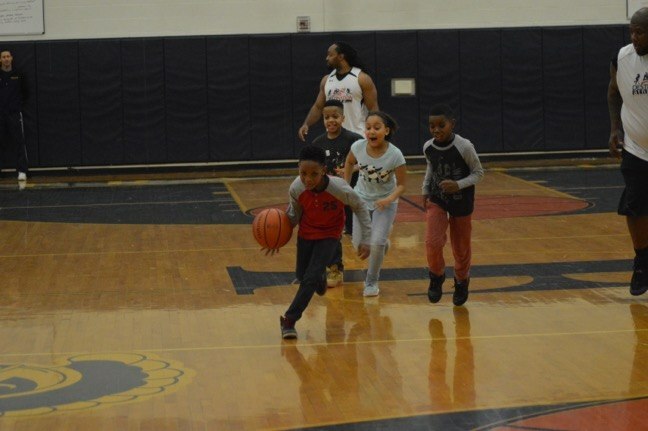 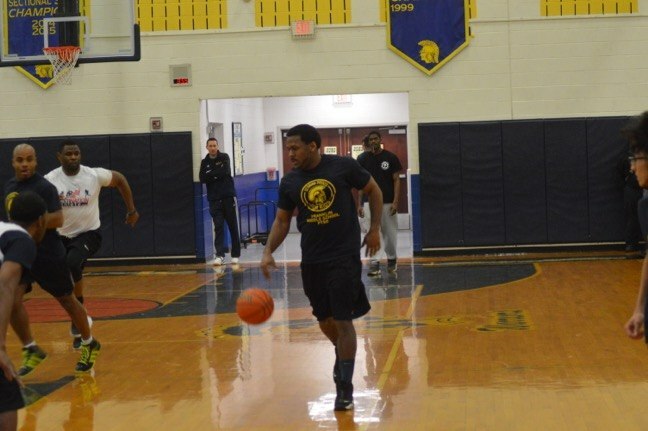 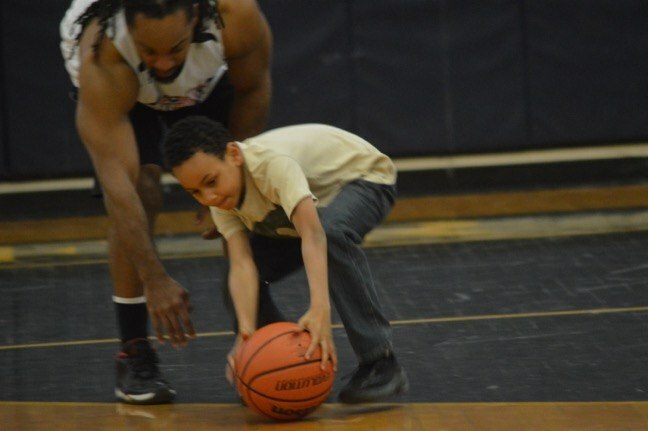 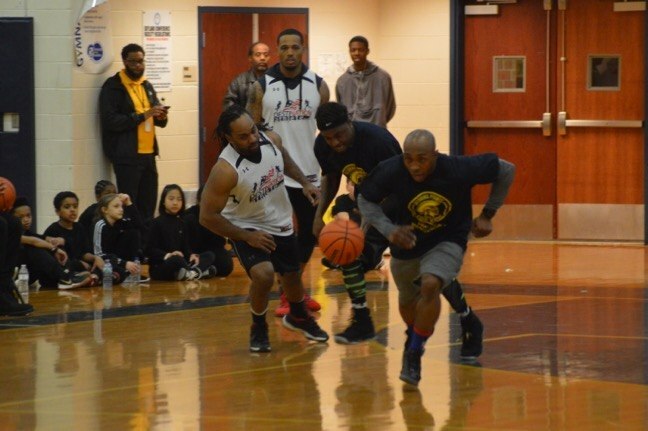 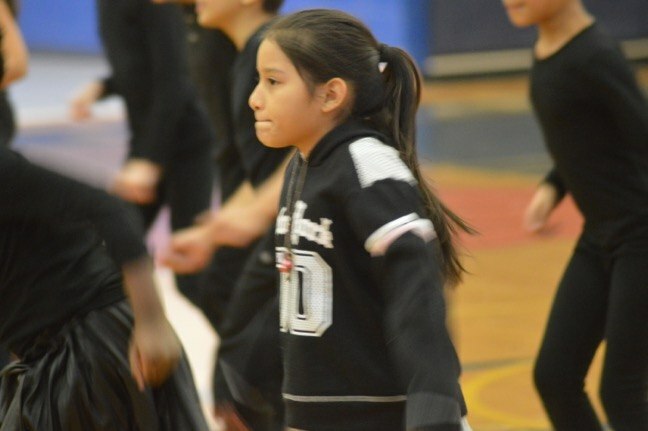 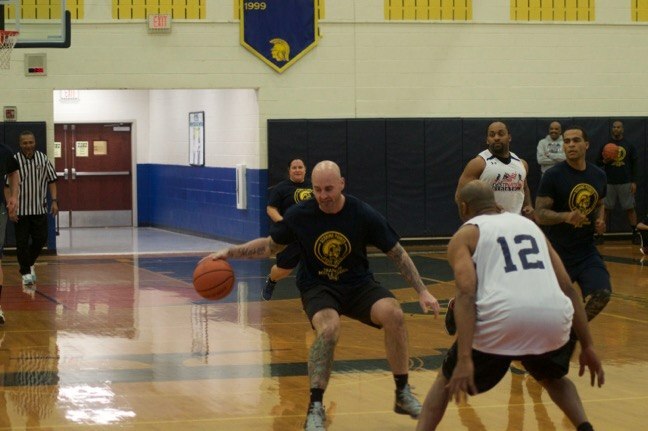 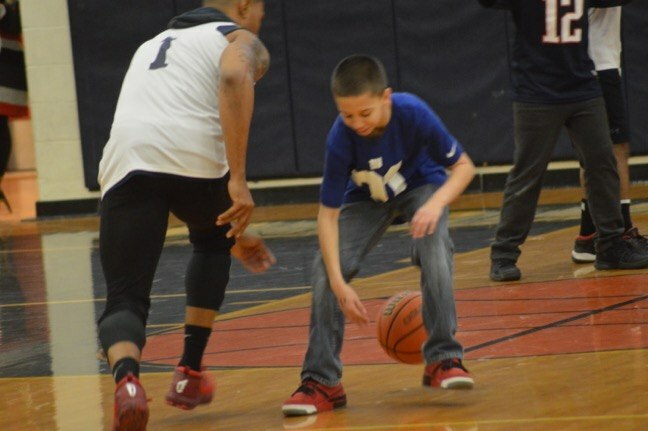 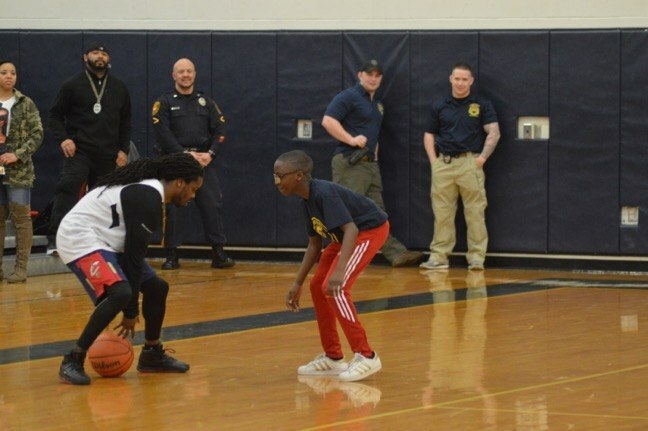 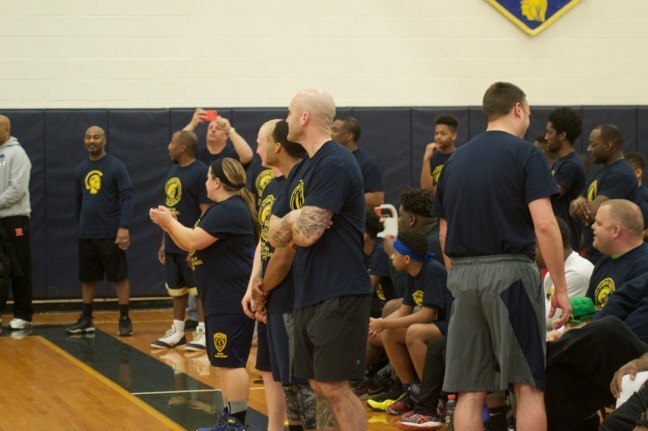 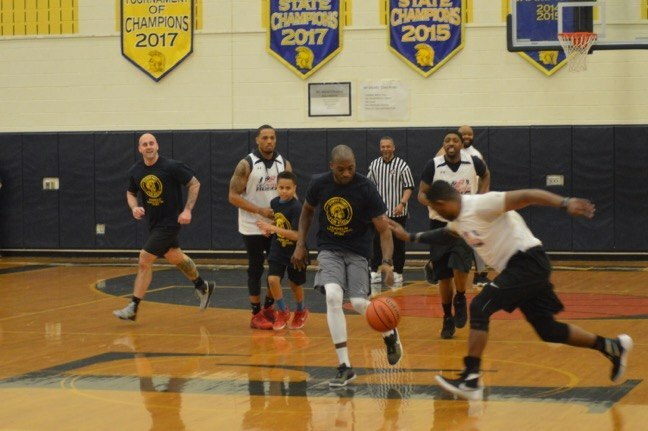 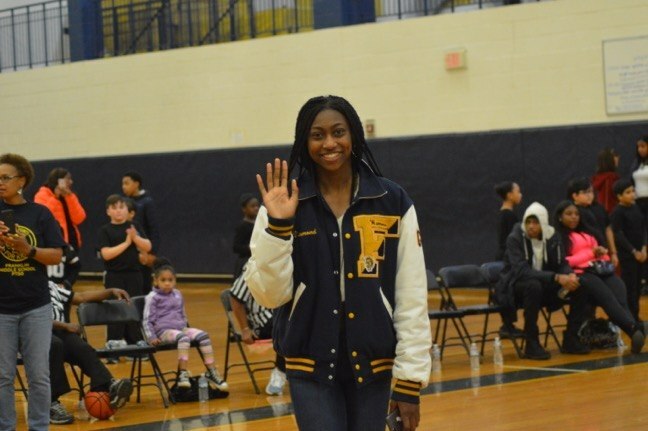 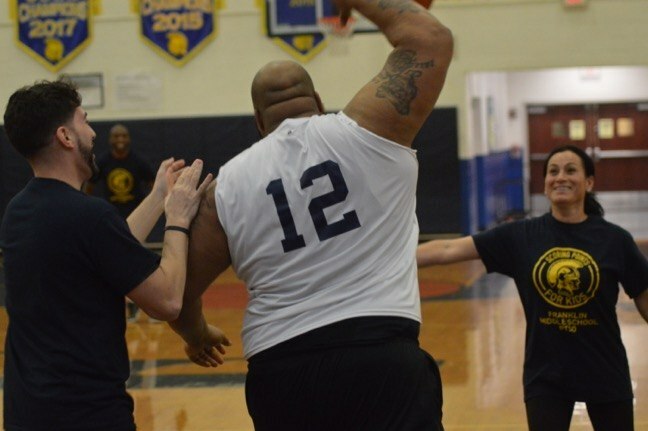 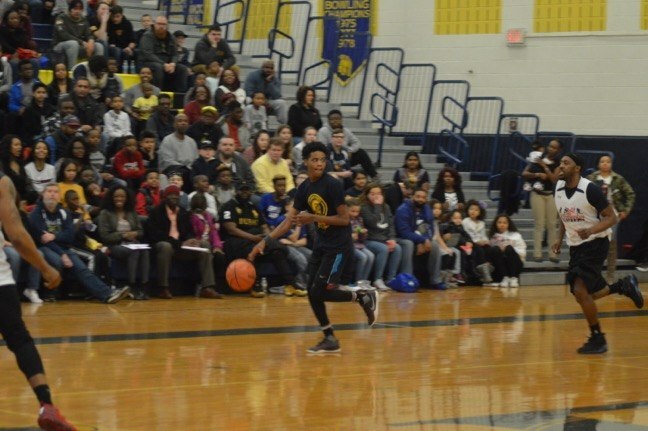 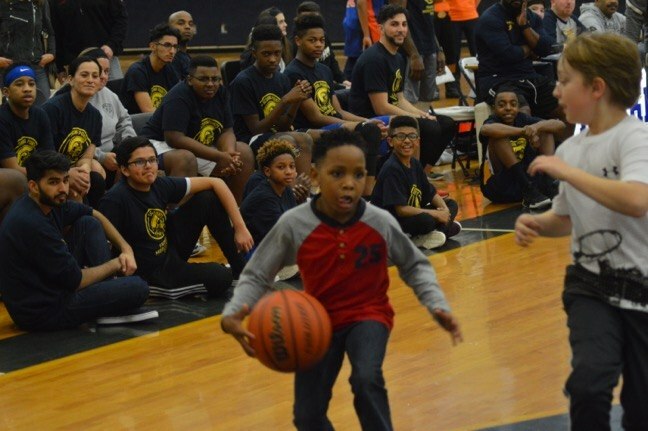 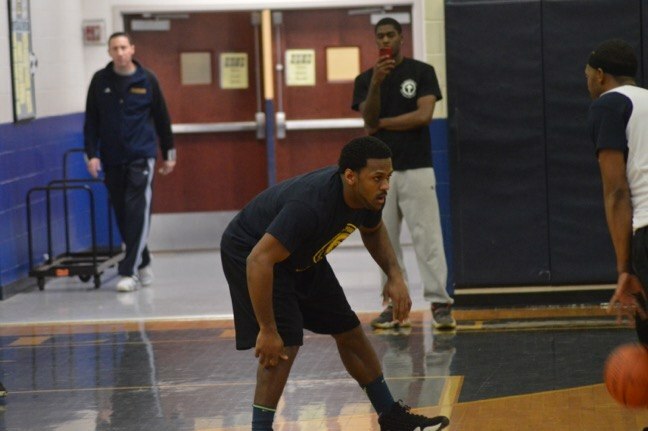 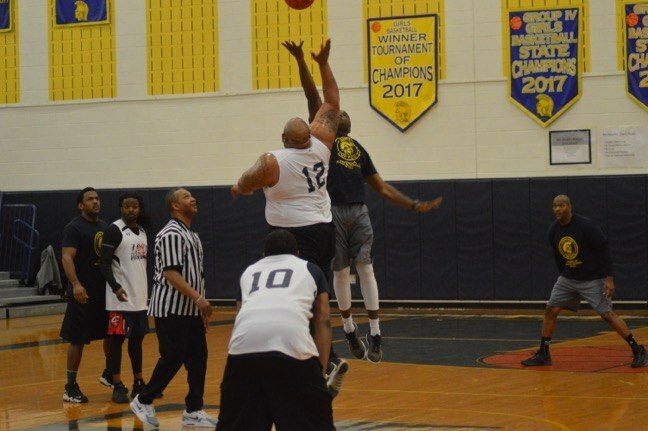 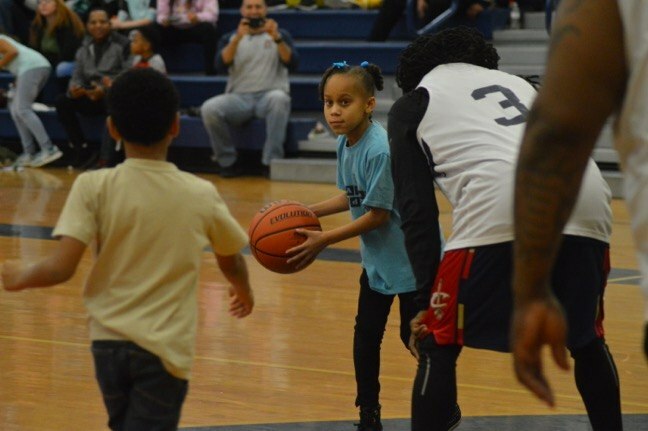 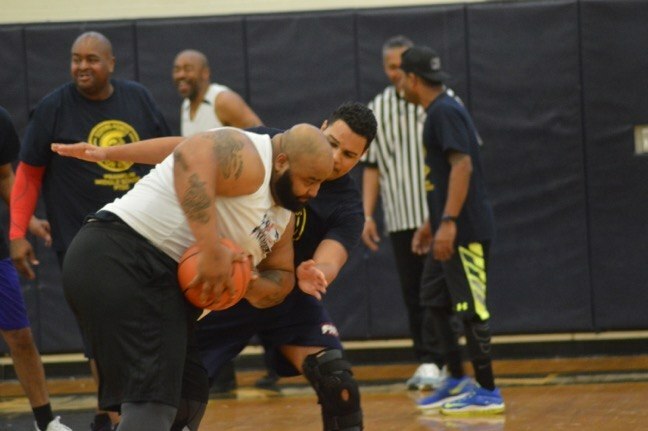 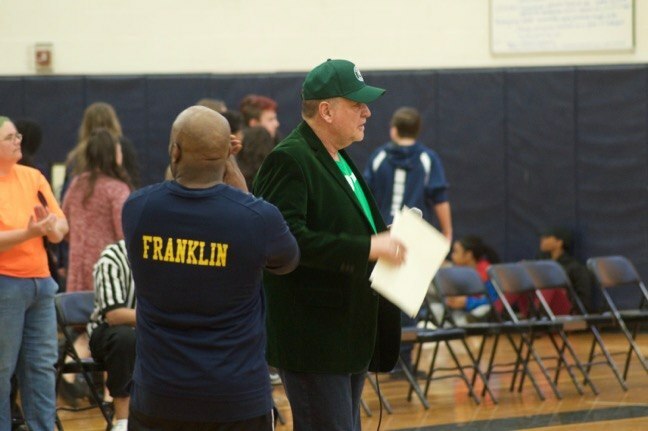 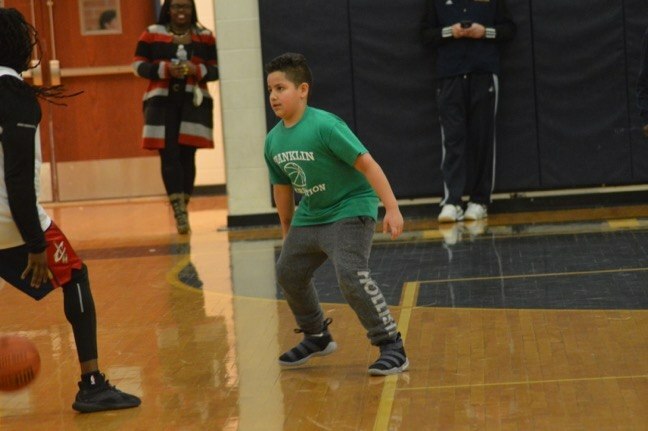 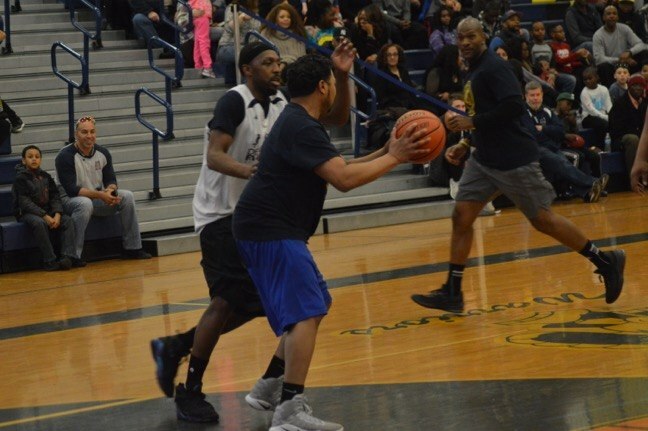 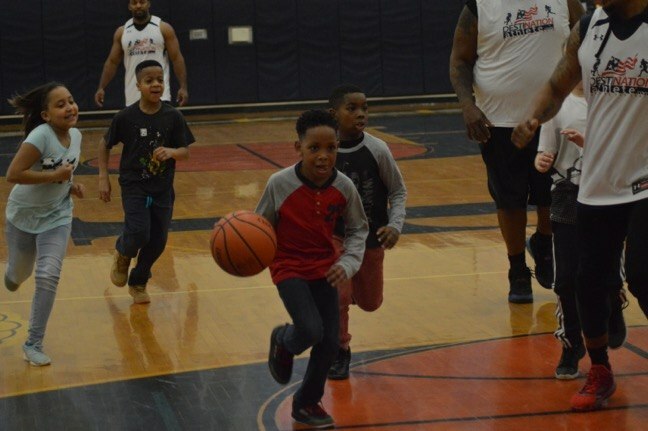 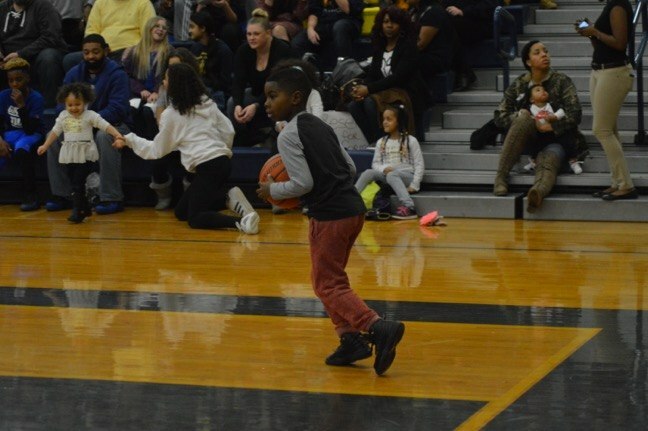 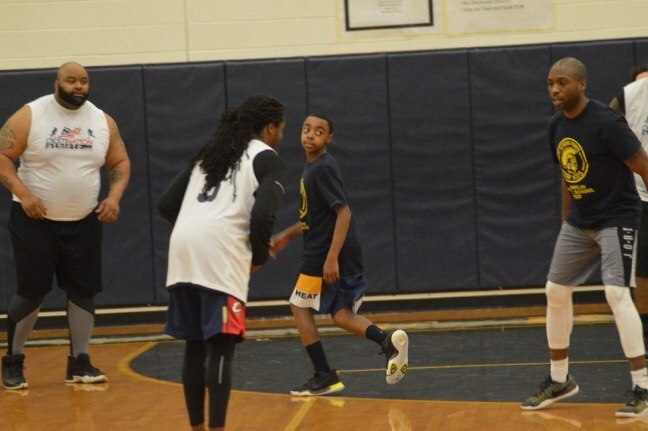 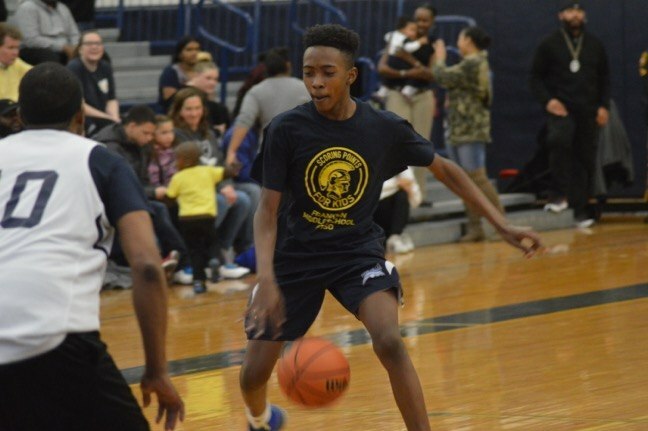 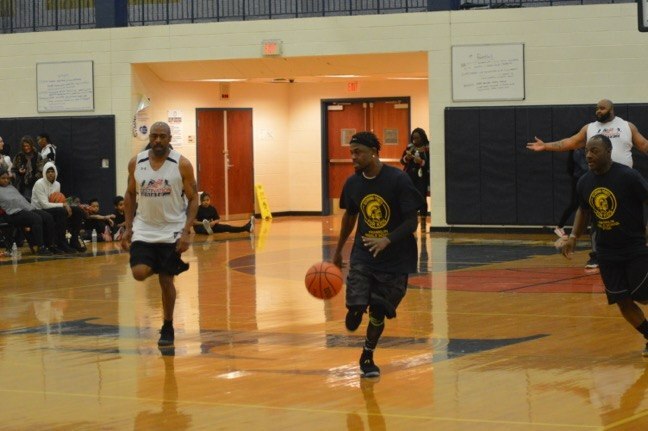 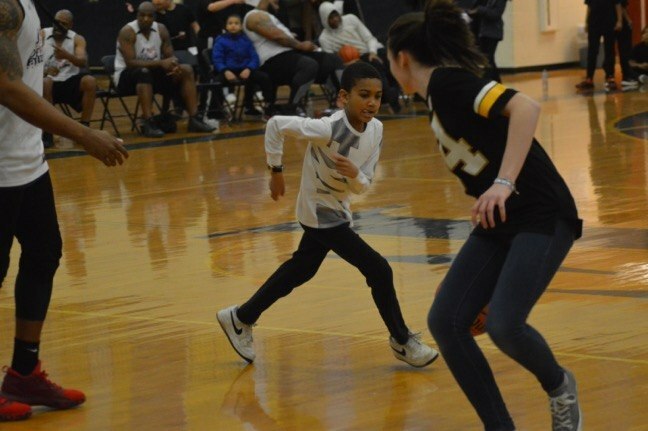 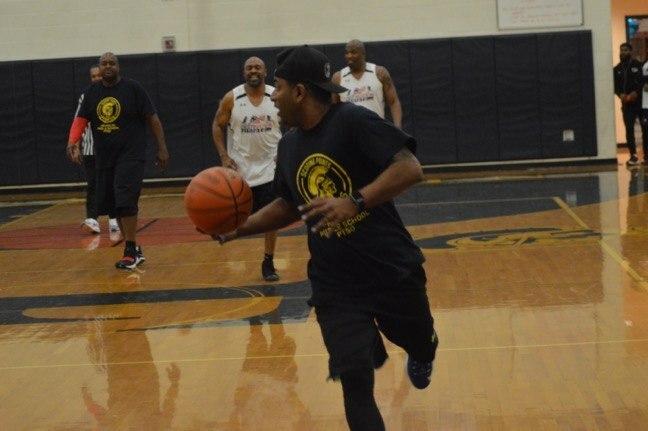 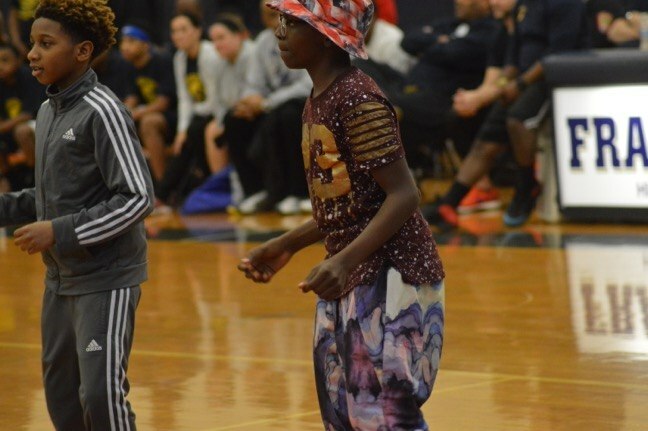 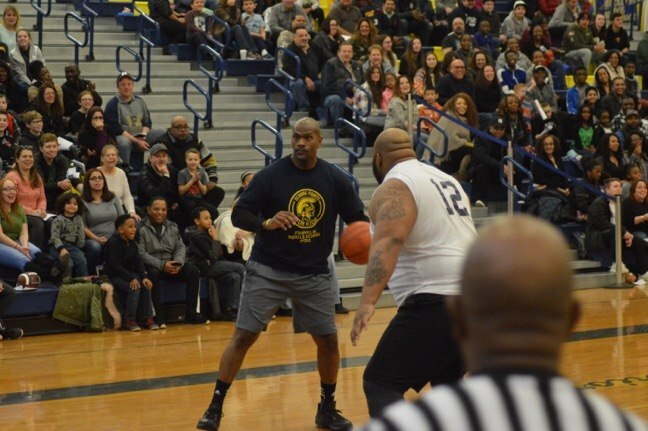 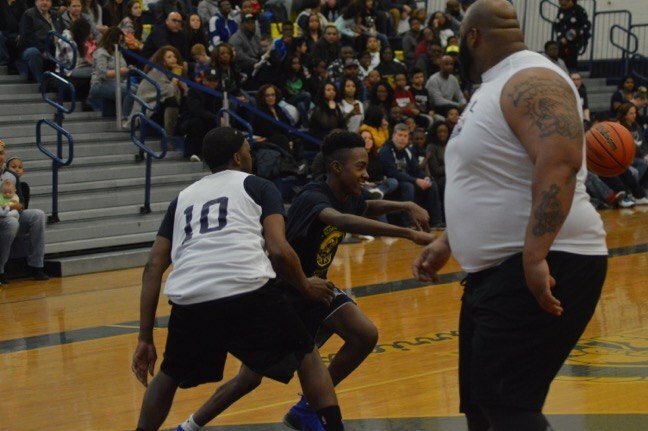 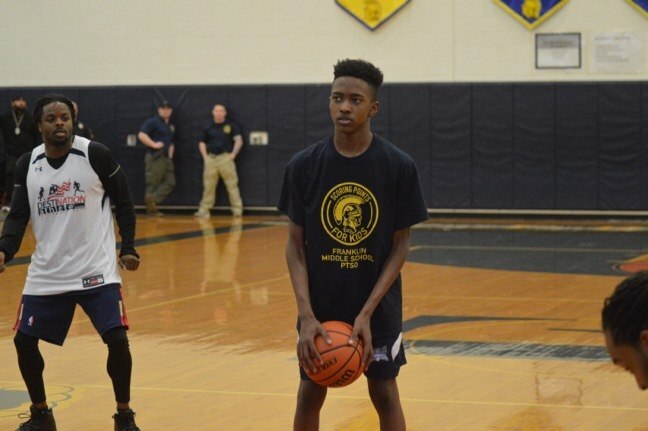 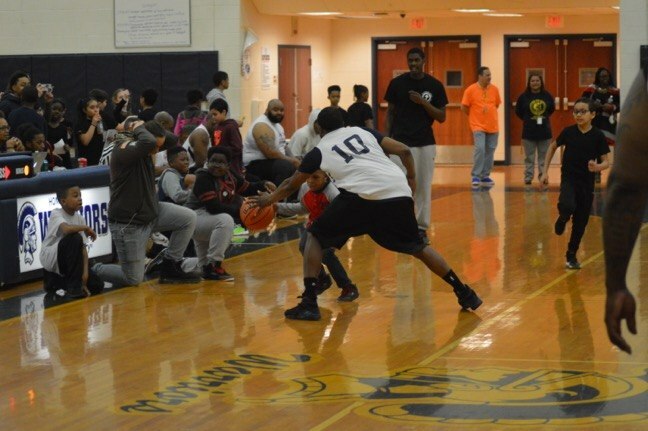 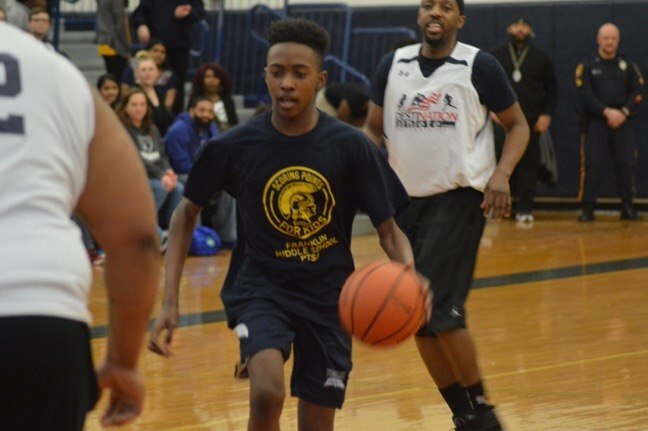 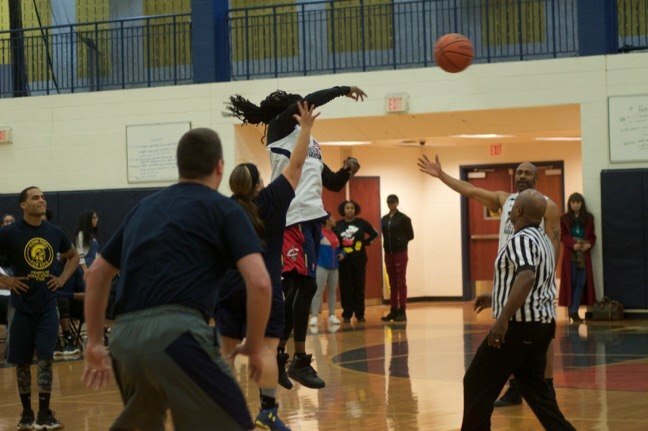 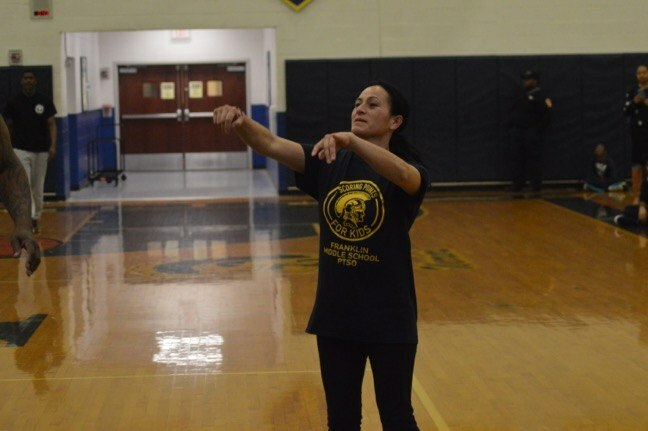 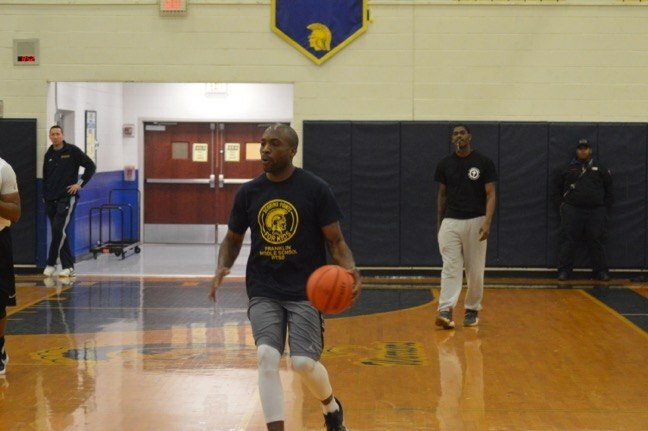 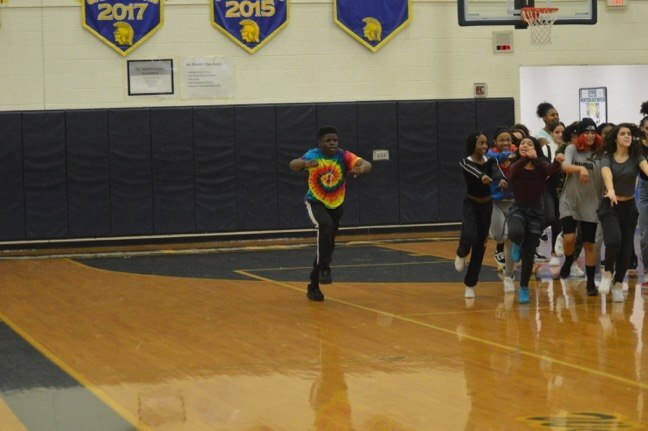 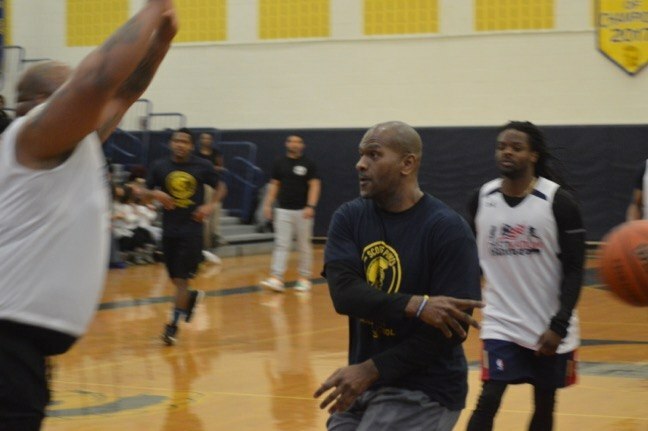 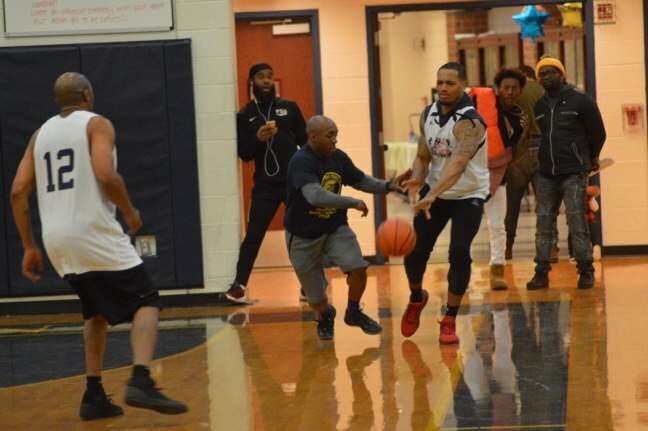 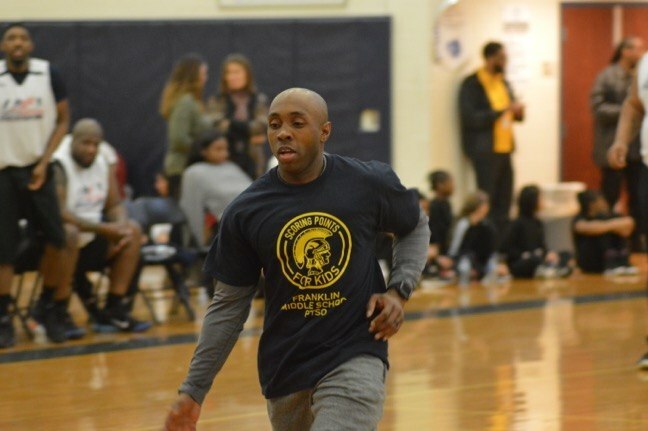 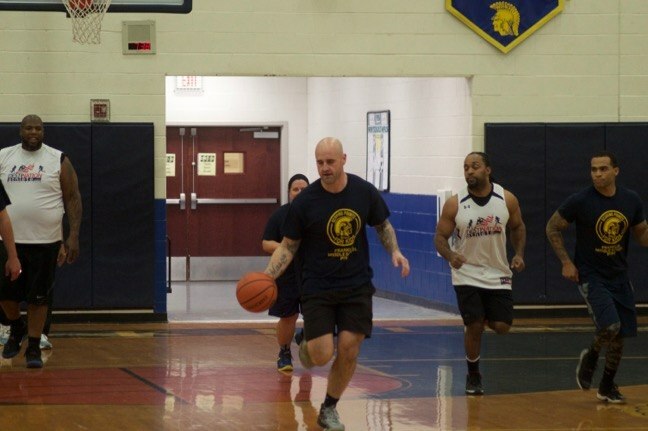 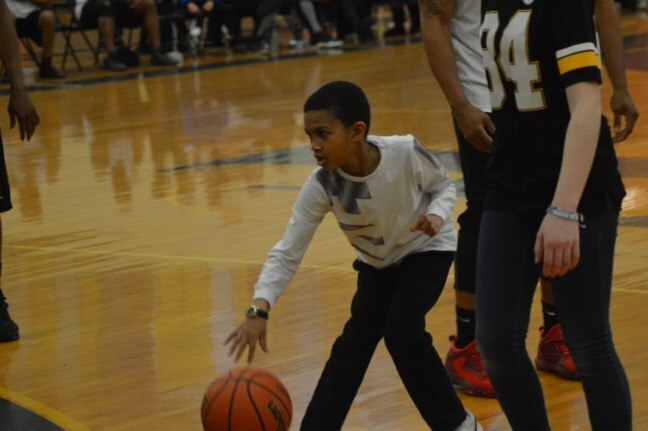 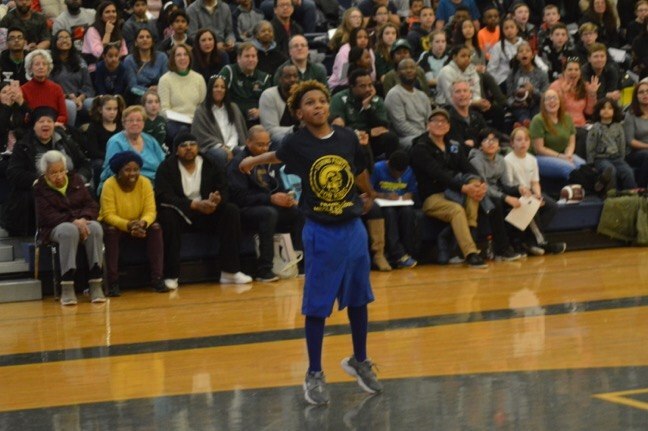 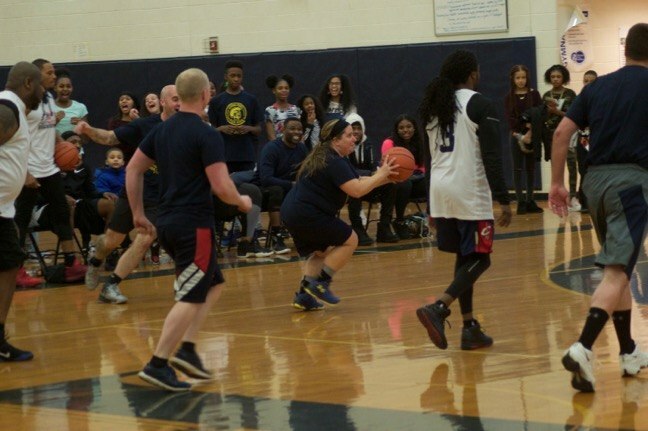 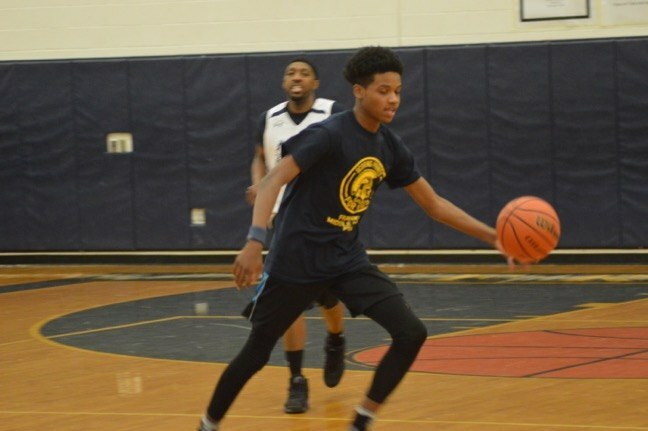 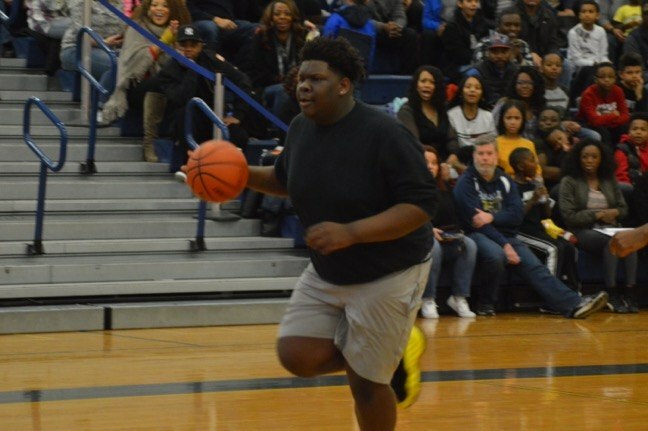 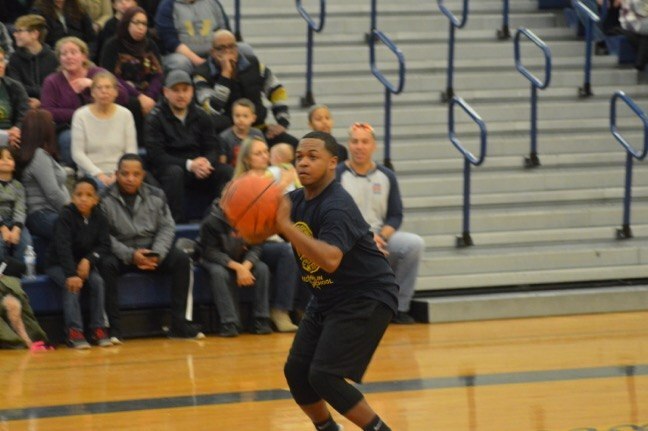 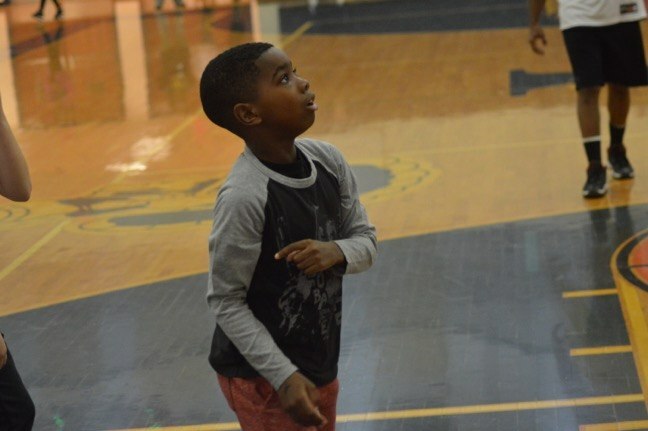 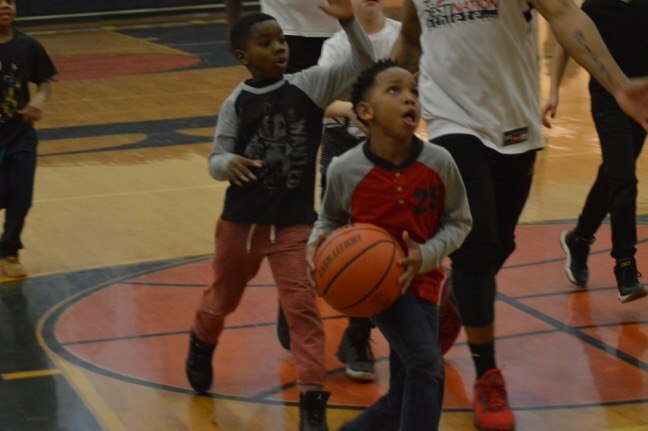 Township police, fire fighters faculty and students of Franklin Middle School got the chance March 17 to play basketball against a team comprised of former professional athletes. 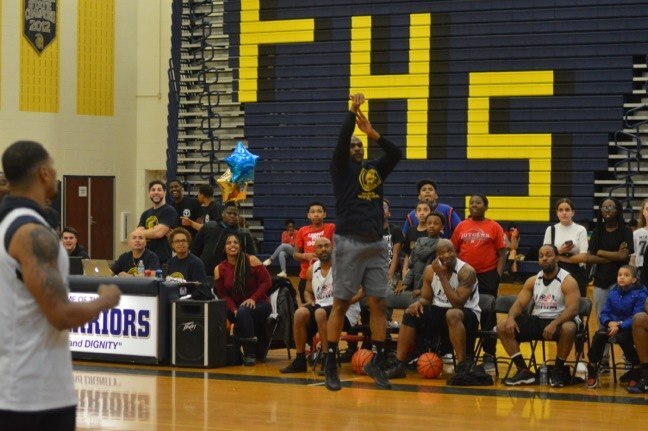 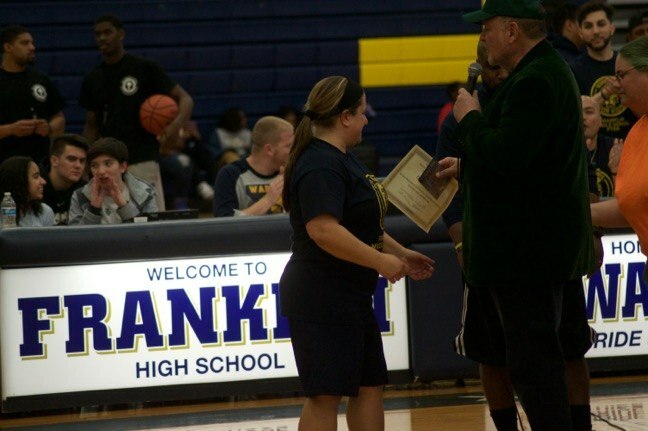 The occasion was the inaugural NFL Pros vs Franklin All-Stars Scoring Points for Kids fundraiser held at Franklin High School. 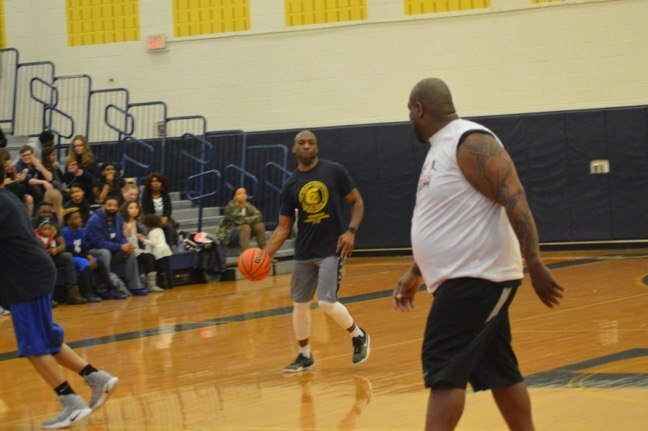 The event benefited the Franklin Middle School PTSO and Lonnie Allgood’s Dreams for Kids organization. 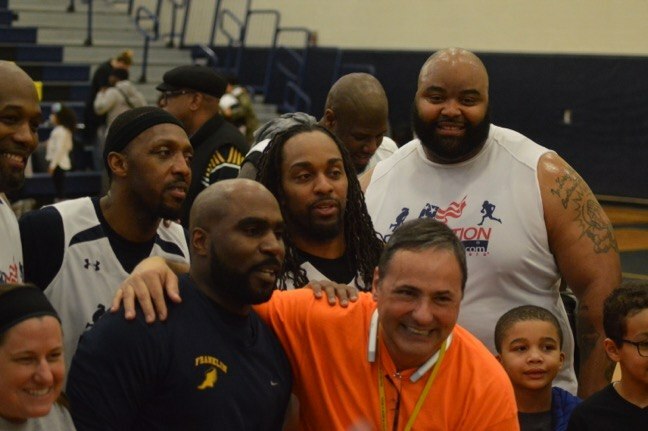 VIP attendees had dinner with the professional athletes, and also had the opportunity to have memorabilia signed by them. 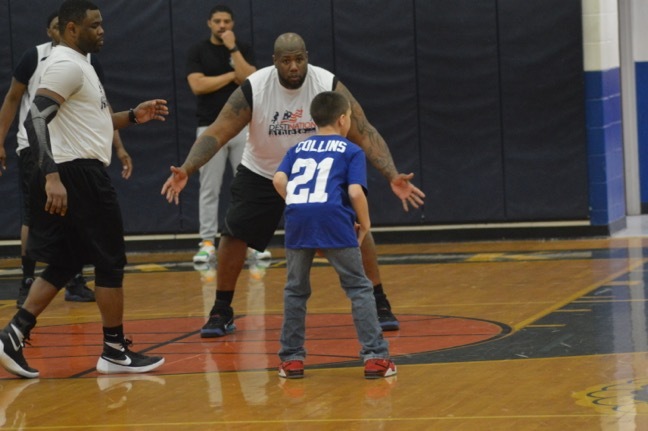 Darian Barnes, a fullback who played with the Tampa Bay Buccaneers, Dallas Cowboys, Miami Dolphins, New York Jets, Buffalo Bills, Detroit Lions and New Orleans Saints. 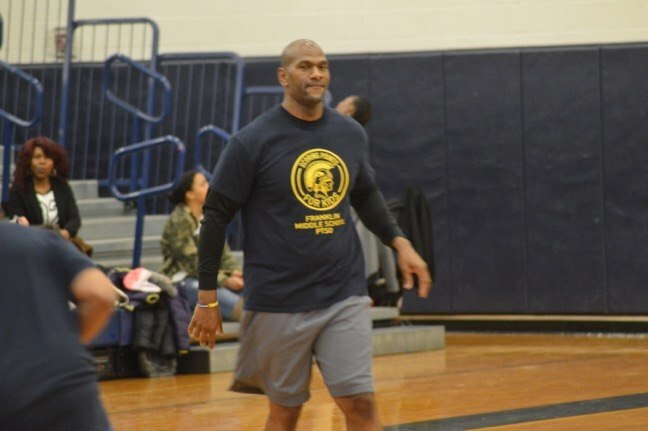 Barnes won a Super Bowl with the Buccaneers. 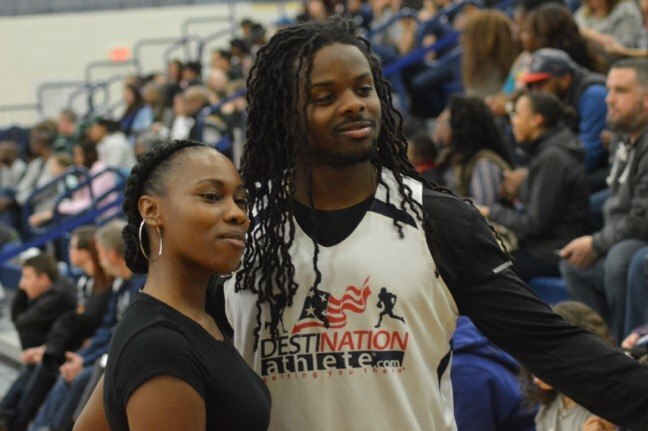 Aaron Beasley, a cornerback who played for the Jacksonville Jaguars, New York Jets and Atlanta Falcons. 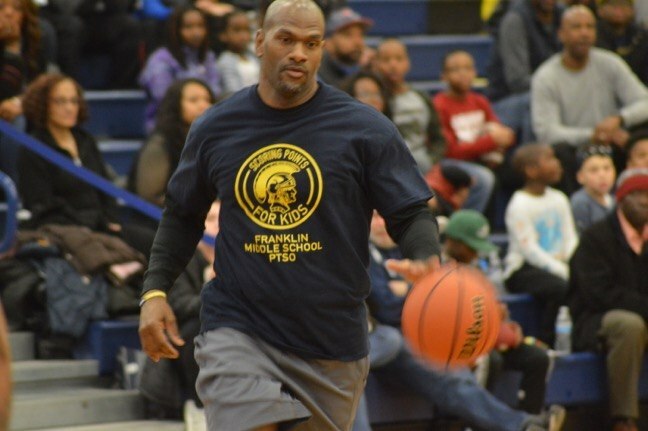 Brandon Bing, a cornerback who played for the Denver Broncos. 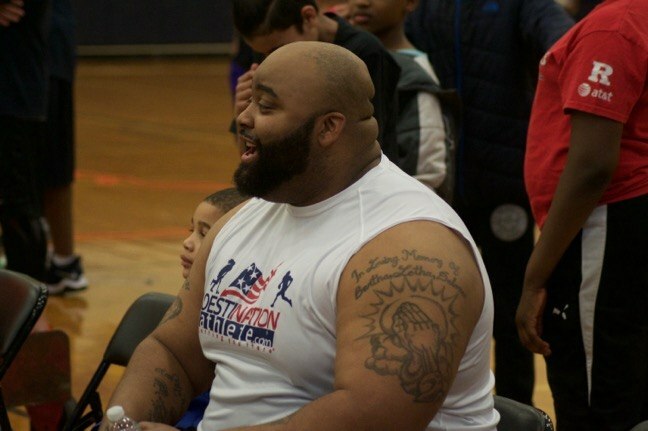 Barrett Brooks, an offensive tackle who played for the Philadelphia Eagles, New York Giants Detroit Lions and Pittsburgh Steelers, with whom he won a Super Bowl. 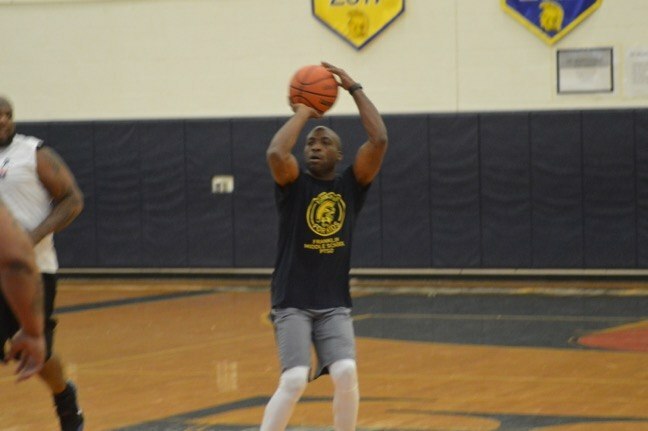 Michael Campbell, a wide receiver who played for the New York Jets and the St. Louis Rams. 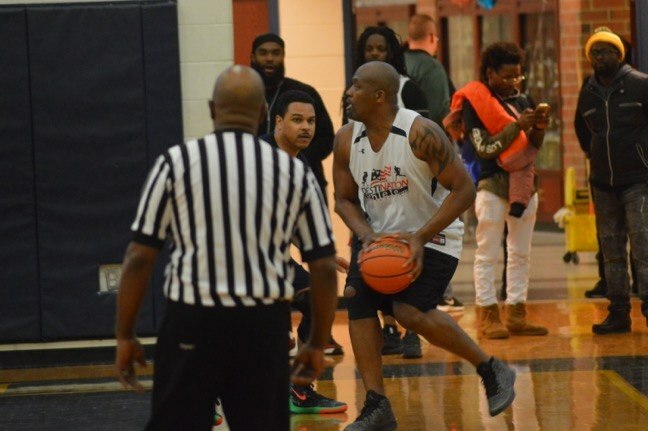 Kareem Huggins, a running back ho played for the Tampa Bay Buccaneers, the New England Patriots and the New York Jets. 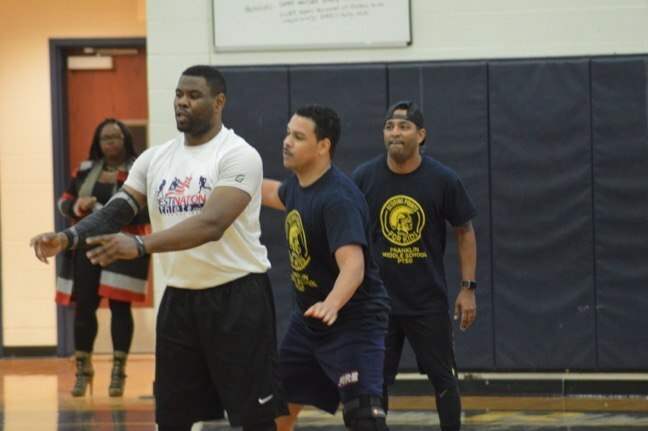 J’vonne Parker, a defensive tackle who played with the Cleveland Browns, the Dallas Cowboys, Baltimore Ravens, Atlanta Falcons, Carolina Panthers and Denver Broncos. 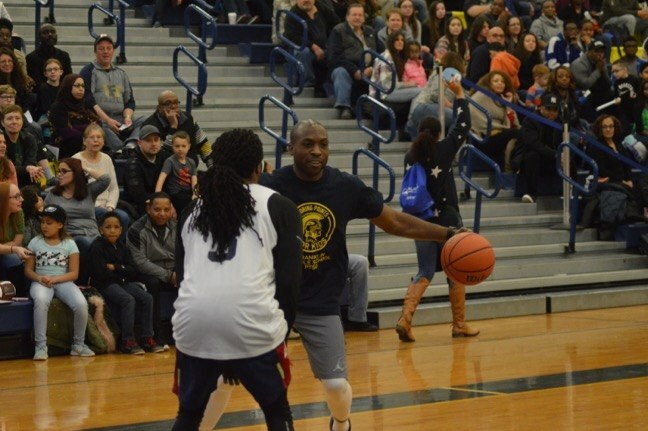 Chad Plummer, a wide receiver who played for the Denver Broncos and Indianapolis Colts. 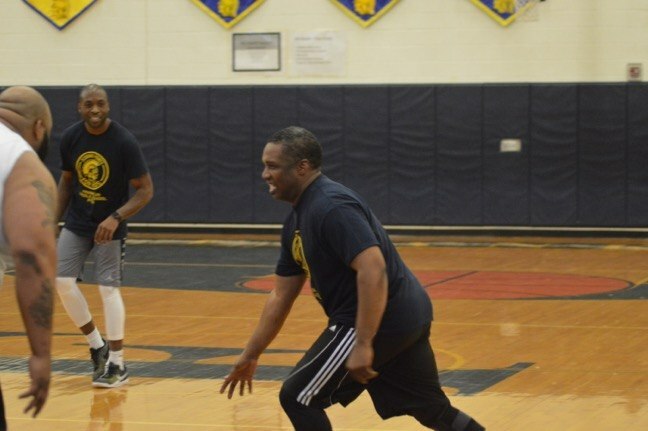 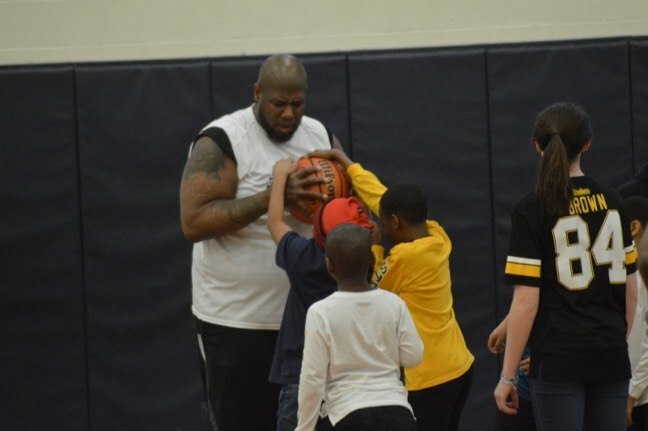 Also playing was Horace Jenkins, who played in the NBA for the Detroit Pistons. 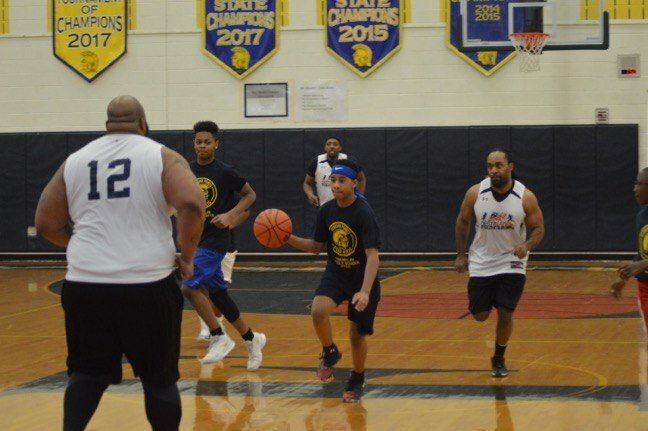 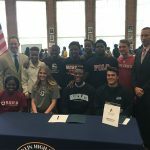 The idea for the game was born when Franklin Middle School principal Nick Solomon ran into Lonnie Allgood, CEO of Lonnie Allgood’s Dreams for Kids foundation, Solomon said. 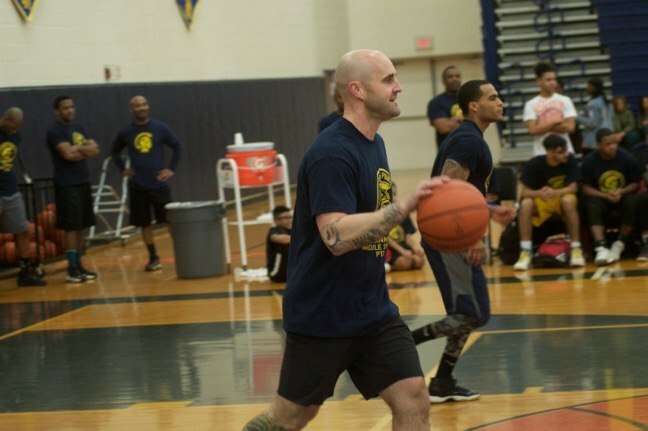 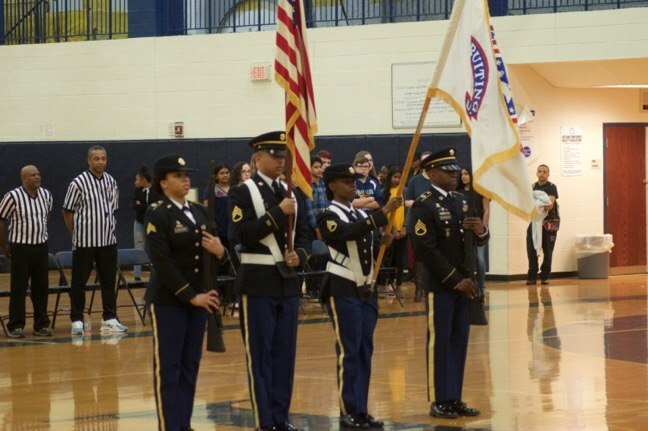 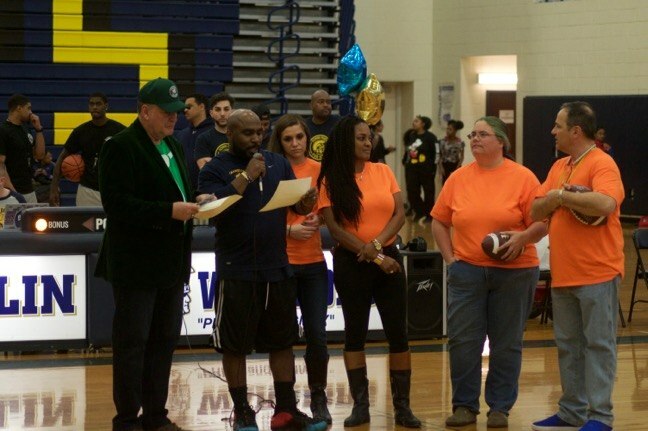 The proceeds from the night were divided between Allgood’s organization and the FMS PTSO. 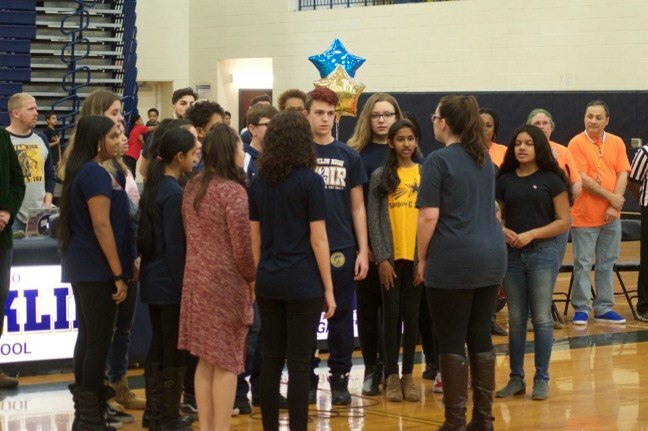 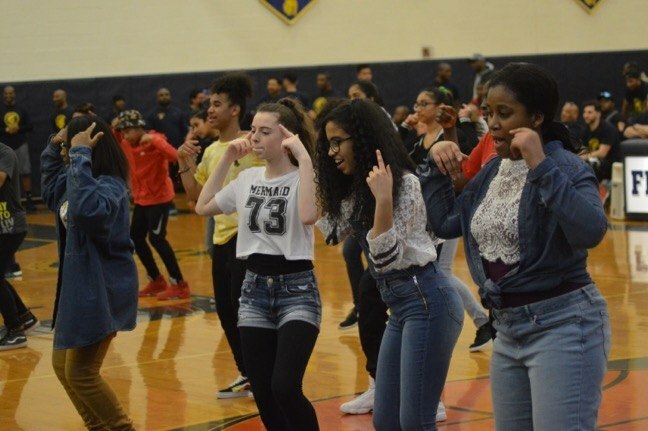 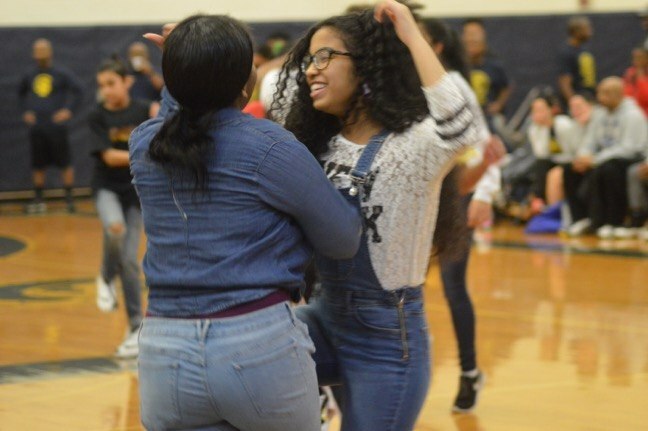 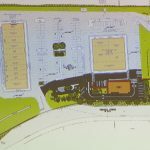 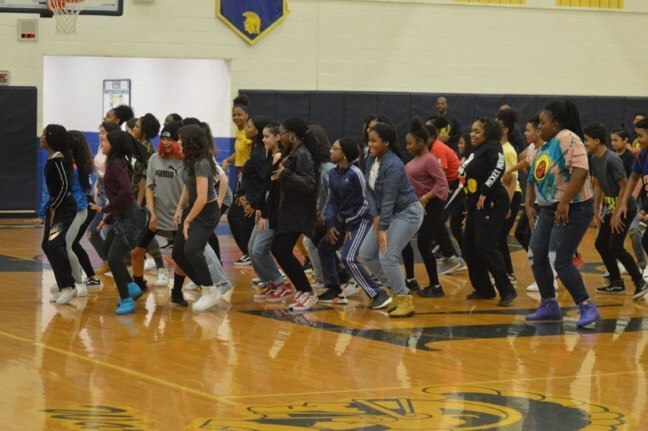 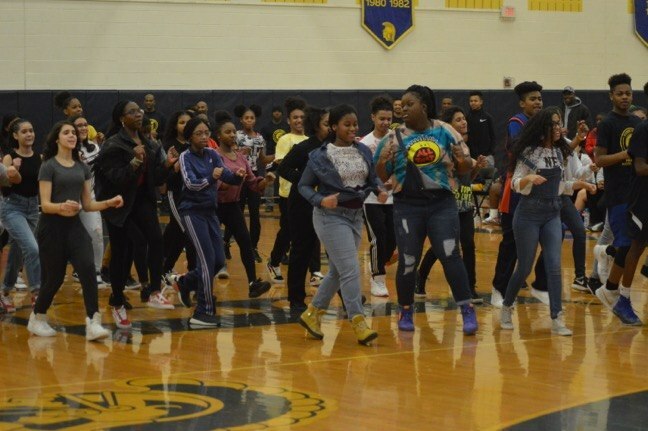 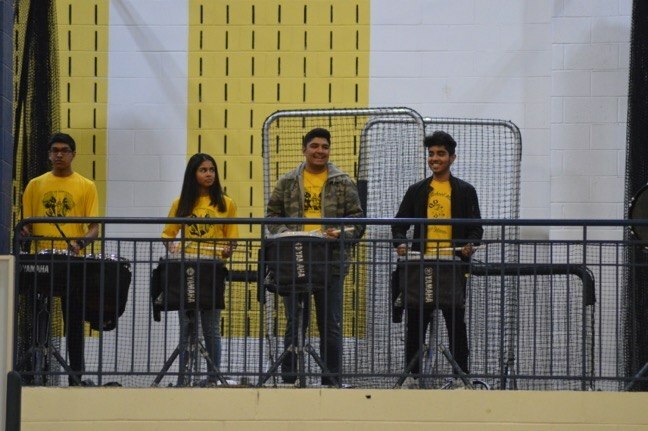 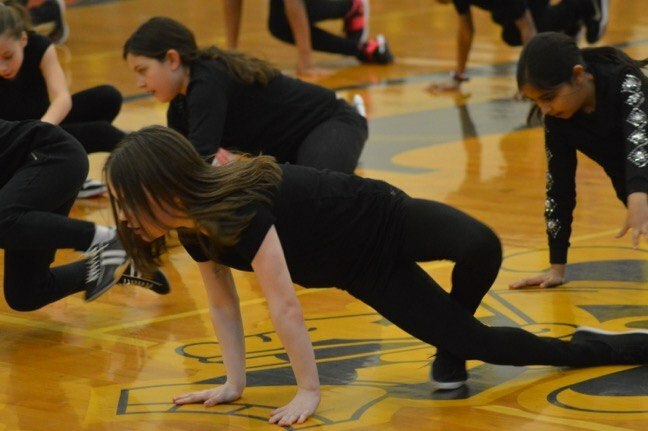 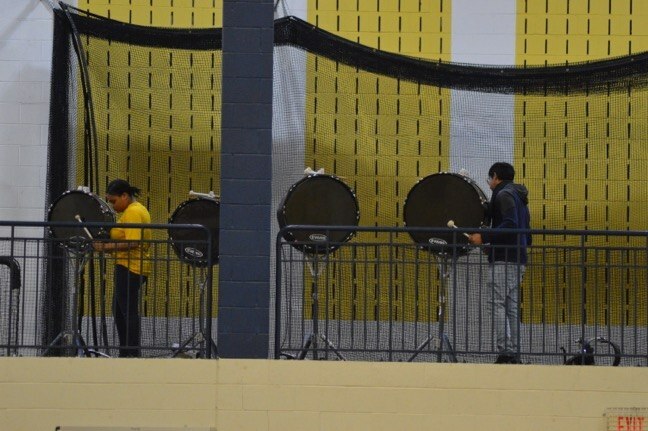 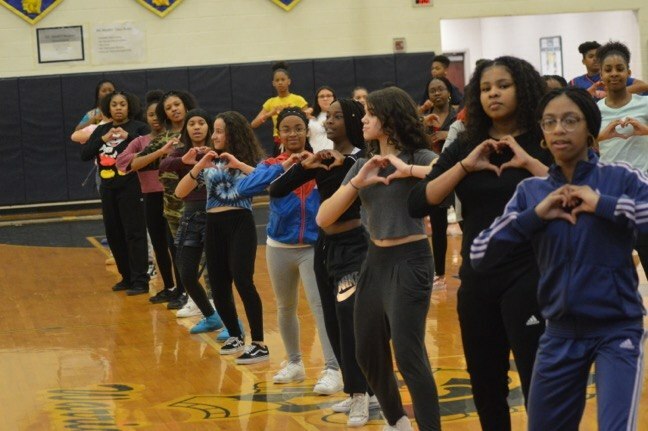 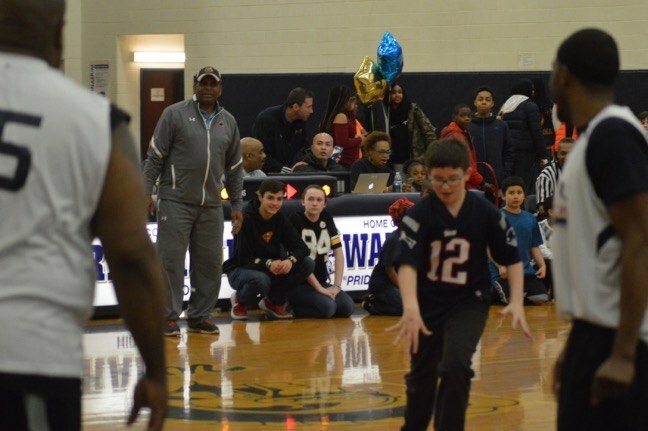 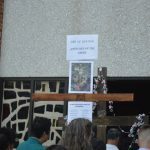 The money will be used to help pay for things such as school trips, the 8th Grade dance, “whatever’s going on at the Middle School,” said Nick DiMeglio, president of the school’s PTSO. 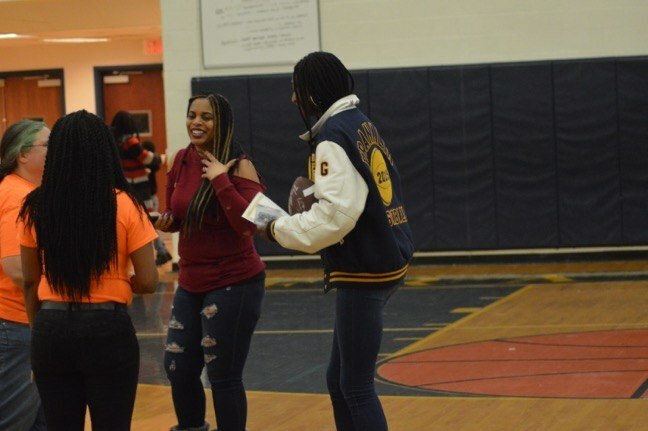 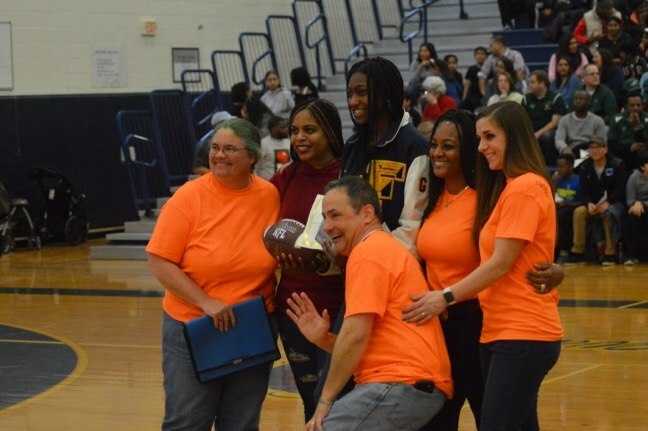 During the evening, certificates of appreciation and gift cards were presented by the PTSO to FTPD Officer Dawn Flanders, the FMS School Resource Officer, and Franklin High School Lady Warrior Diamond Miller. 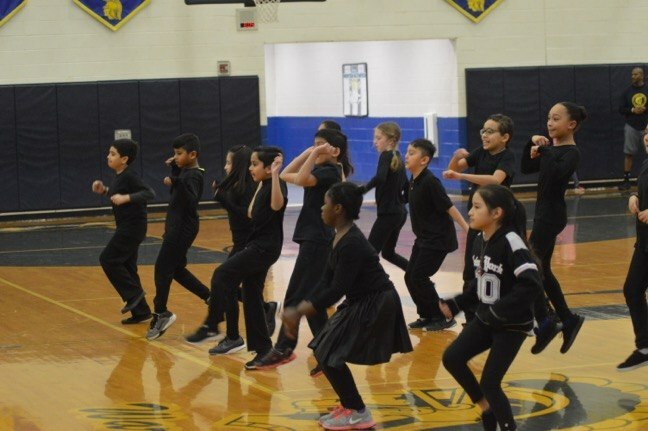 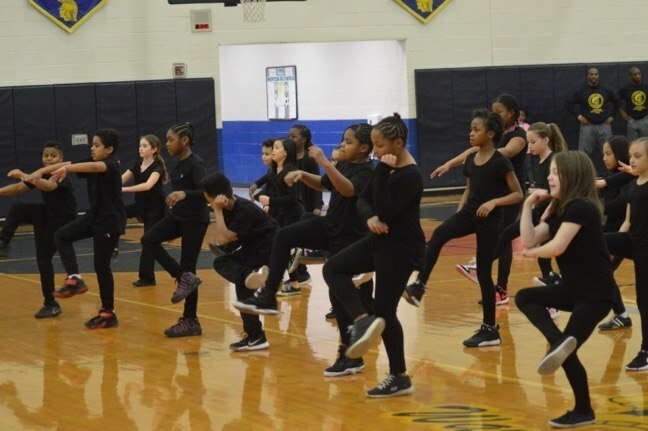 Halftime featured ance performances by troupes from township schools. 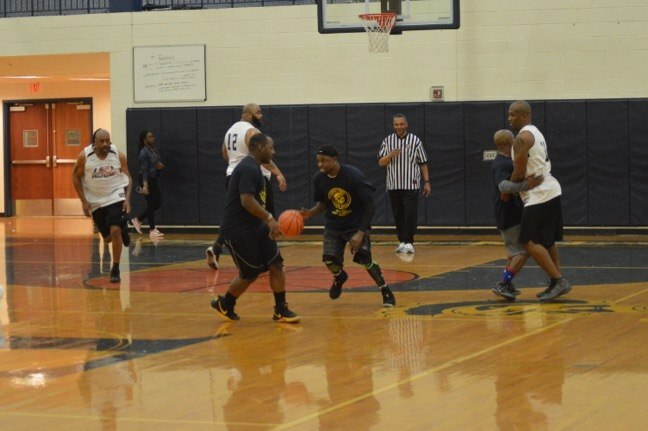 The NFL/NBA pros won the game in overtime, 58-56.